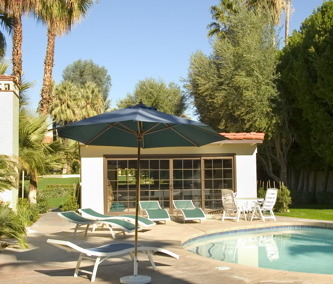 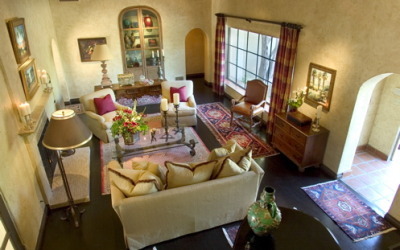 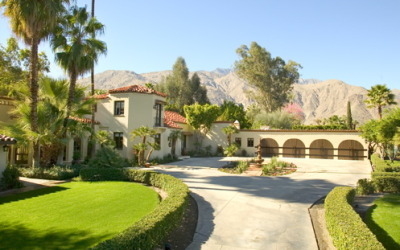 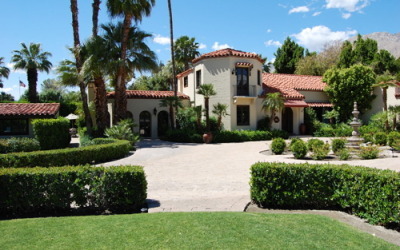 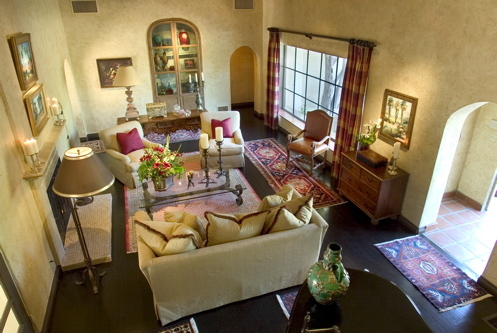 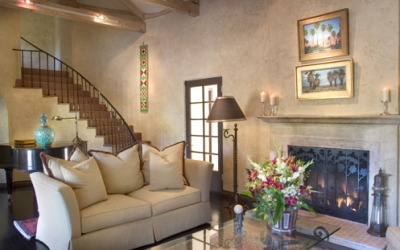 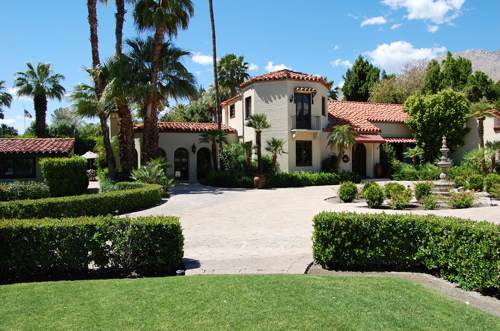 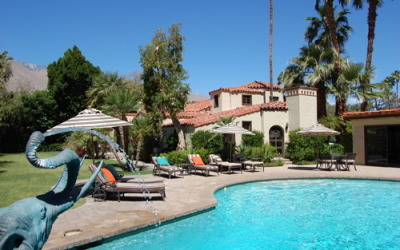 Sand Acre Estate is a 5 BR, 6 BA luxury vacation rental in Palm Springs, CA that is rich with Hollywood History. Nestled in the heart of The Movie Colony neighborhood, Sand Acre is a circa 1933 Spanish Estate situated on a coveted one-acre in-town lot. 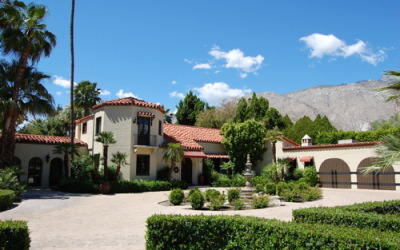 Rumored to have been frequented by Marilyn Monroe, it is noted to be where she and Joe DiMaggio often spent time together while in Palm Springs. 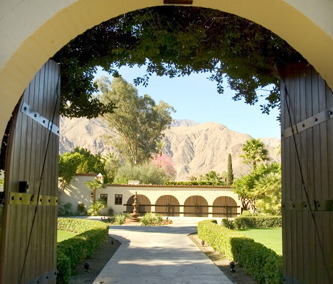 Elegant, secluded, and stately, Sand Acre is one of the Grande dames of The Movie Colony. 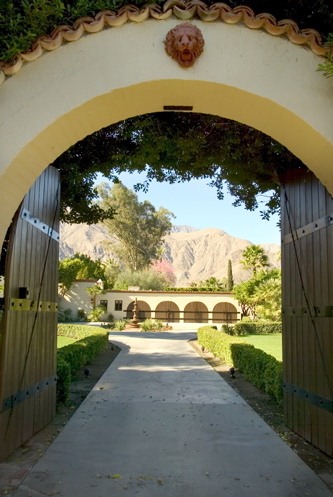 Walled and gated for the utmost privacy, guests are greeted with fifteen-foot tall Spanish wooden gates, which open onto the cobblestone motor court. 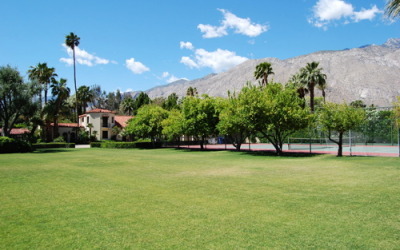 Vast lawn, abundant fruit trees, private tennis court and stunning views of the rugged San Jacinto Mountains rising from the west welcome guests to this Palm Springs estate. 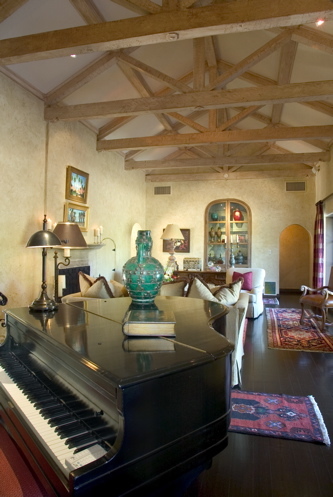 A large plank and iron front door opens into the Great Room, with exposed beam and rafter ceilings paying homage to the properties heritage. Abundant comfortable seating makes this space ideal for conversation, reading, or general relaxation. 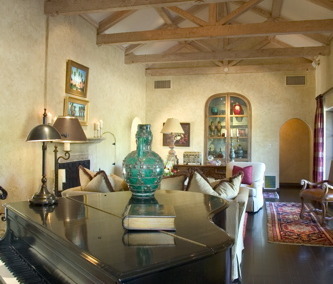 A formal Dining Area is located off of the Great Room, situated adjacent to the updated Chef’s Kitchen. 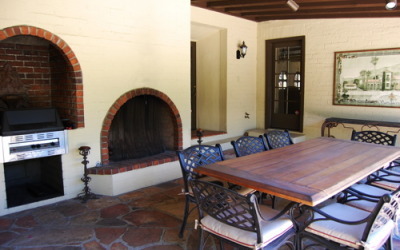 The oversized round dining table will seat up to eight guests with ease, perfect for casual or more formal dining. 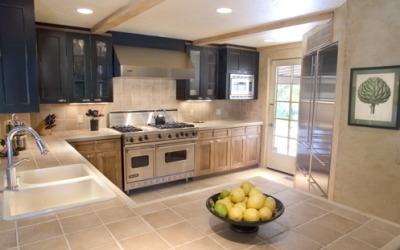 The large Chef’s Kitchen is recently updated with a full-suite of stainless steel appliances including a Viking Professional Gas Range. 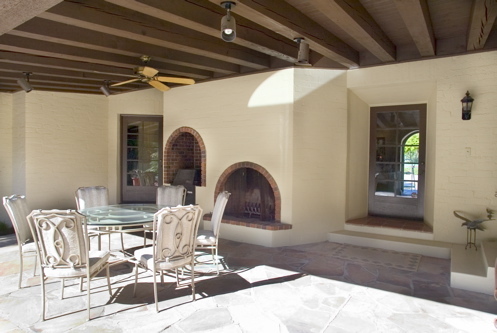 Thoughtfully appointed, this space is sure to inspire culinary creativity of any level, from a casual lunch to an elegant dinner. 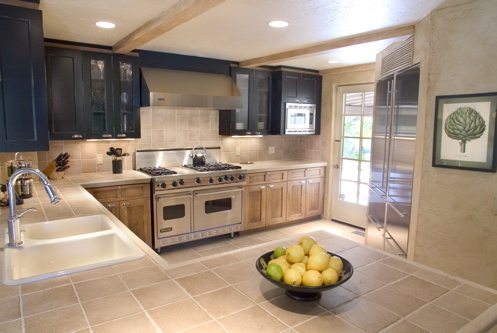 A Breakfast Bar also provides additional seating for casual conversation during meal preparations, or enjoying a quick meal. 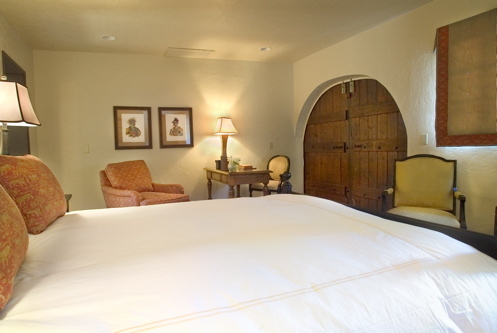 Adjacent to the Kitchen is a Media Space, with 43” Flat Screen TV, in-home media, fireplace, and four comfortable overstuffed club chairs. 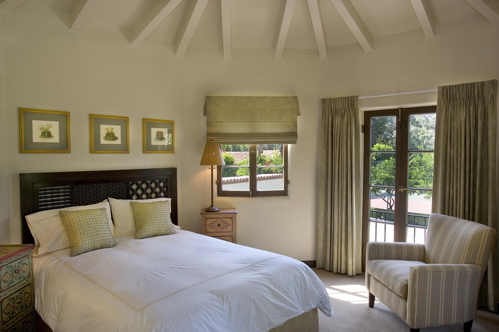 Sand Acre features five guest quarters, each with en-suite baths. The Master Suite offers a King sized bed; Flat Screen TV and en-suite bath with dual vanities, soaking tub, and shower. 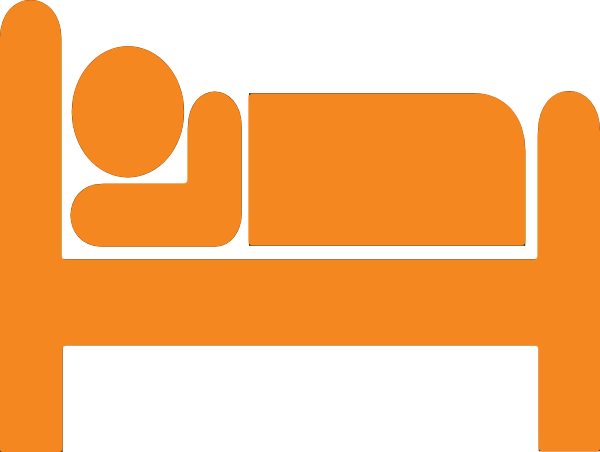 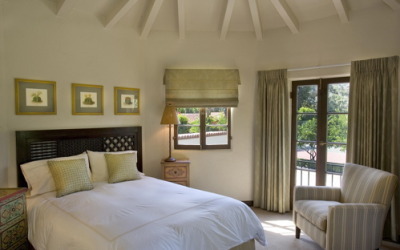 The First and Second Guest Quarters are interconnected- The First Guest Quarters features a King sized bed, Flat Screen TV and en-suite bath with shower and Second Guest Quarters, a Queen sized bed, Flat Screen TV and en-suite bath with shower. 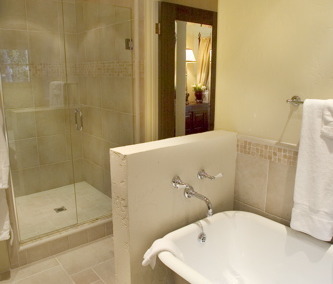 The Fourth Guest Quarters feature a Full sized bed and en-suite bath with shower. 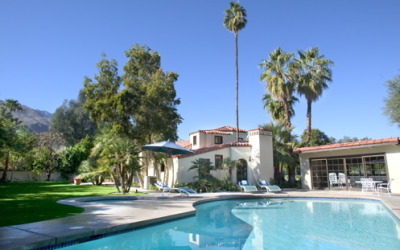 The Fifth Guest Quarters is located in the “tower”, rumored to be where Marilyn Monroe stayed. 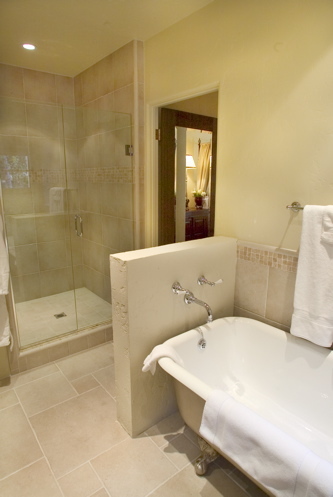 It features a Queen sized bed, Flat Screen TV and en-suite bath with tub/shower combination. 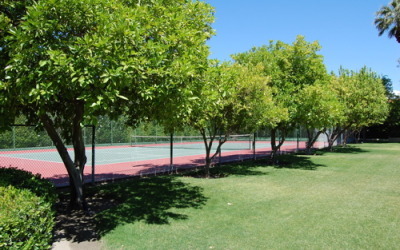 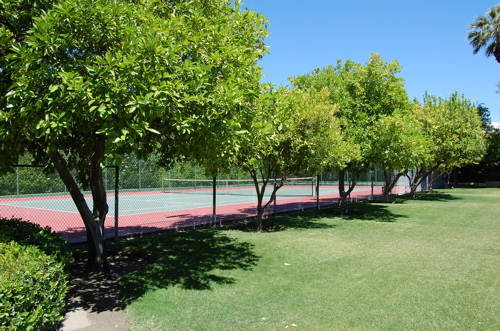 Sand Acre is surrounded by stunning manicured grounds for guests to explore, with expansive lawn, a private tennis court and producing fruit trees throughout. 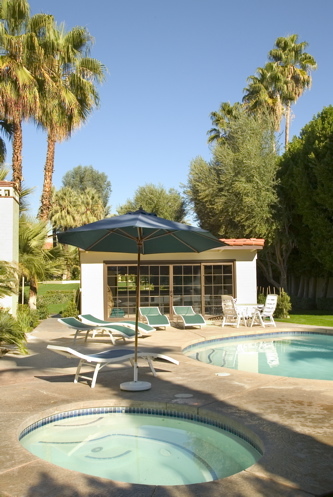 The in-ground Pool and Spa feature an oversized patio area, poolside cabana, and multiple chaise lounges, ideal for an afternoon relaxing in the sun. 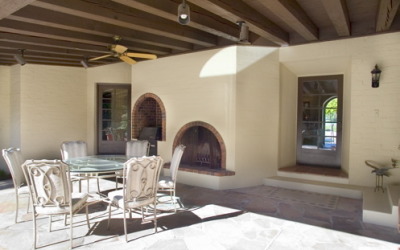 A large covered patio is accessible off of the Kitchen and Great Room, and features an outdoor dining area, built in barbeque grill and fireplace. Marrying the notion of contemporary luxury with the opulence of this properties historic era was the essence of the extensive renovation of picturesque Sand Acre. The Movie Colony Neighborhood is rich in history and lore, yet is still a short drive to the most popular attractions in Palm Springs, including fine dining, culture, and nightlife of Palm Canyon Drive.